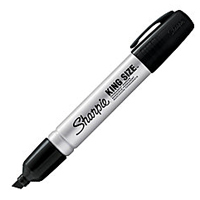 Sharpie permanent markers are an industry standard. 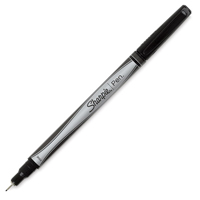 They are permanent on most surfaces, fade and water resistant with a quick-drying ink. Now available in a broad range of colours and styles, including: Brush Tip, Retractable, Chisel Tip, and Double-Ended, as well as the Classic Fine and Ultrafine Tips. Won't bleed through paper. Write with confidence! Industrial strength for the toughest marking jobs. Sharpie Paint markers are permanent and opaque. They are quick-drying and resistant to water, fading and abrasion and mark opaque and glossy on light or dark surfaces. Use on virtually any surface: metal, pottery, wood, rubber, glass, plastic, stone and more. They are xylene free.